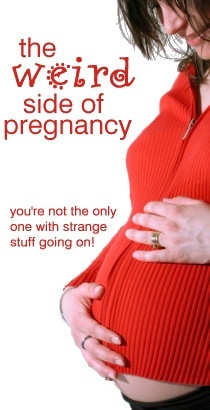 Soon, I discovered that other pregnant women's bodies also lived weird, secret lives. Shelley in Ontario had what she calls hot feet. "I had to soak my feet in cold water a few times a day, and slept with a fan on them at night, even in winter. They felt like they were on fire!" No one could offer her a medical explanation. Judi in Pennsylvania reports that she wasn't nicely rounded like the picture-book pregnant women: "It looked like I had a hill on my left side. Even at the end -- and, to be honest, even three years after." Alas, no photos of Mt Judi survived. Vilma's belly was the envy of all sun-worshippers throughout her first three pregnancies. "My belly would get real dark as though I had sunbathed. Unlike the mask of pregnancy, the color was even all through the front of my belly." A few months after the birth, "The darkness would go away... peeling off -- like a sunburn." Her doctor teased her about wearing a bikini. "He really thought it was funny." Sue's belly was more maddening than amusing. Her wild itching intensified when cloth touched it, "so I walked around for those last two weeks with my maternity pants rolled down to my hips and my t-shirt rolled up under my breasts!" Her mother's husband may have been permanently scarred by the sight. "Here I was, nine months pregnant, with my bare belly hanging out, covered with a red rash. Every so often, I'd give in to the horrible urge to itch. I'd scratch all over my belly with a sort of wild-eyed relief. Of course, moments later, it would be even more itchy and painful than before." Steroid creams didn't help -- nothing did -- and the doctor was concerned about performing a c-section on that ravaged skin. Mother and baby, however, came through nicely. What makes the "bump" do what it does? Anne in North Carolina wondered when, during a vacation in her seventh month, she began to feel "huge, like I was going to explode. Shortly after this feeling started, I had dinner, and promptly threw it up. For three days, anything solid I ate came back." Back at home three days later, she was eating normally again. Her doctor's best explanation was that the baby "had been breech up 'til that point and was now head down -- so he thought she must have gotten stuck in an odd transverse position while turning, and stayed that way for several days, cutting off part of my stomach or small intestine." The fun doesn't restrict itself to the belly, however, as Tracy in Washington learned when she developed a pelvic bone infection early in pregnancy. It felt like she was being "kicked with steel-toed boots" in her most sensitive region, forcing her to go on disability until her son was born. "It was so nice to give birth," she adds. Joyce in California just hated to sit down, because her entire genital area would go to sleep as soon as she sat, and the pins-and-needles sensation when it "woke up" was excruciating. "My midwife was extremely skeptical; for an otherwise competent person, she was amazingly unsympathetic about that." Left to decipher it on her own, Joyce figures, "Probably the edema shifted everything around and sitting upright pushed everything down, resulting in nerves getting pressed against pelvic bones." Ruth in Illinois found that pregnancy changed her lovely soprano voice. "When I was pregnant with William, my voice got very dark and mezzo-soprano-ish -- think Wagnerian opera diva with horned helmet. My voice teacher and I were convinced it was a boy, because of whatever extra testosterone was coursing through my veins." Testosterone thickens the vocal cords, which can produce the darker sound. Her second pregnancy offered something different. "When I was pregnant with Ellen, my high notes became lovely and ringing, with none of the darkness from the previous pregnancy. My voice teacher and I were sure it was a girl. I remember telling my OB about our prediction just after Ellen was born, and it was the first she'd ever heard of such a theory." Most women can feel and see the baby kick, punch, and even jump or roll, but Ruth felt something else altogether: "I could feel both babies breathing near the end of the pregnancy, when they were positioned just so and I was very still. My OBs both pooh-poohed this, but it was quite clear to me what was going on. I'm thin, and there wasn't anywhere for these babies to hide, so any of their movements were quite obvious." Sometimes, it's not the mom whose body goes haywire, but someone close by. A friend of Shelley's was more sympathetic than most: "The day I went home feeling nauseated, she threw up in the parking lot. If I was awake all night with leg cramps, so was she. Back aches, heartburn, she even had pains the night I went in to the hospital in false labor!" she says. "The night before I gave birth, all of this mysteriously stopped. She had the best night's sleep she'd had in months, while I had five hours of labor." Like most weird pregnancy symptoms, my ticking disappeared the day my son was born. My quest for the source of that rare sound, however, may never end.